Look at the margins in the box score, if you can stomach it. Coming off a 3-9 season in 2017, the UConn Huskies have a long list of problems, including a few that only time and playing actual football can fix. For example: there is only one upperclassman on their starting defense, and not much experience or depth anywhere else. 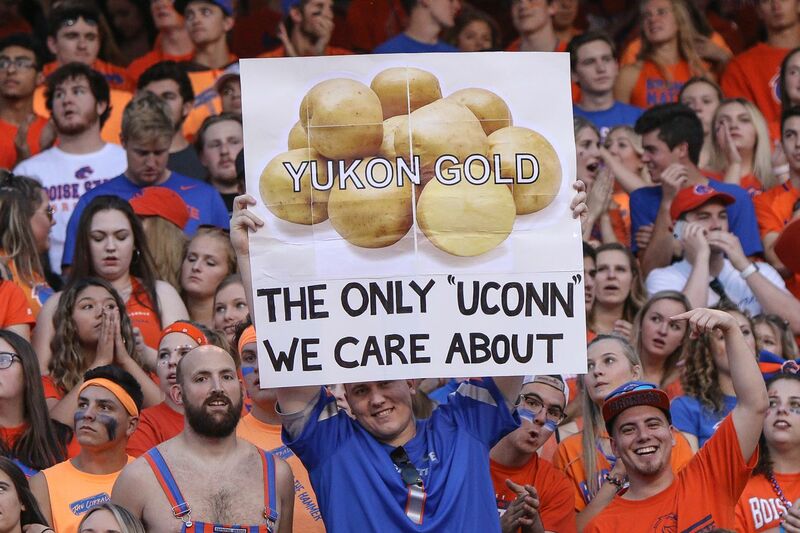 A road game at Boise State is a lot to ask of anyone. In 31 years on the blue turf, Boise State has only lost at home 37 times. It was a lot to ask of UConn, especially. This was never going to be a good game for UConn, but what it turned out to be was so much worse. It was enough to make me think, “This is the most lopsided game I have ever seen in my entire life watching college football.” That was just a feeling, though, right? No. It turns out that feelings, for once, are actual facts. 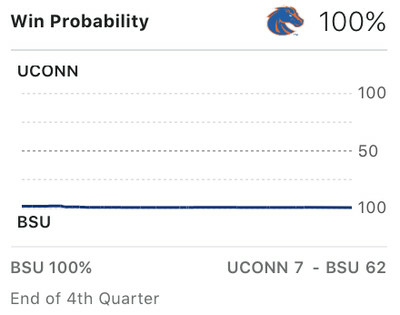 This past weekend, Boise State might have actually destroyed UConn in the most lopsided FBS vs. FBS game I have ever seen, but it goes beyond the scoring margin. On the rewatch it looks … worse than the box score? And that’s just talking about the UConn offense. On the Huskies’ first eight full possessions, they punt seven times and throw an interception. UConn’s offense doesn’t cross the 50 until the middle of the third quarter and only does that once. The Huskies’ lone touchdown drive is it. The rest is handing the ball back to Boise, then watching that ball head back towards their end zone with horrifying efficiency. The defense has a worse night. Boise’s offense does not need help to blow someone out, but gets it anyway. After about seven and a half minutes, the Broncos score five TDs on just 15 plays. TD drive one: Two. Plays. TD drive two: Four plays, 43 yards, practically demure by Boise’s standards, thanks to great field position. TD drive three: Six plays. Brett Rypien is just pitching and catching at this point, even the runs are all huge gaps, this is clearly an atrocity, and we are all accomplices. TD drive four: 55-yard end-around TD run. This is heinous. TD drive five: Six plays, and it already feels like Boise is trying to burn clock IN THE FIRST HALF OF AN ACTUAL GAME VERSUS AN FBS OPPONENT. They still score. It’s over in about 10 minutes of game time. In a situation this bad, even the circumstantial things add up badly for UConn. For instance, after all that, did the Broncos get the ball to start the second half? Oh you bet they did. Did they score in one play, a simple screen pass designed to nibble away at the clock? Seventy-four yards later, yeah, they did. For once, the way I felt about a game was accurate statistically. This was a biblical-type plague for UConn, but not an unfair one. UConn only committed one turnover. Both teams had seven penalties, with Boise getting more yardage taken by infractions. The Broncos putting up 818 yards of offense — 418 through the air, and an even 400 on the ground — is remarkable all by itself, sure. Only 15 teams since 2000 have done that. But most were in shootouts or blowouts in which the losing team did some scoring. There’s a 72-43 Missouri State-Mizzou in 2017, a 63-17 Nevada win over Idaho in 2010, a random 70-21 Toledo blasting of NIU in 2007. One of those games featured two teams who did it in the same game: 2016’s 66-59 Oklahoma victory over Texas Tech. Those are things that make sense. This game, though? There is no sense in here. Boise gained 818 yards of total offense, while UConn finished with just 193. If this felt like a historical-type asskicking, well, it was. The yardage gap between the two teams was unprecedented in 21st century FBS football. These are statistics confirming a few things. First, that Boise State has dealt out not one, but two of the most lopsided annihilations in college football history. Two, that if you felt like UConn-Boise State 2018 was, in your gut, as lopsided a game as you’ve ever seen, then your gut is pretty good at math. Three, you don’t want Bama, but on the wrong night, you definitely don’t want the Broncos either, unless you want to be a footnote.